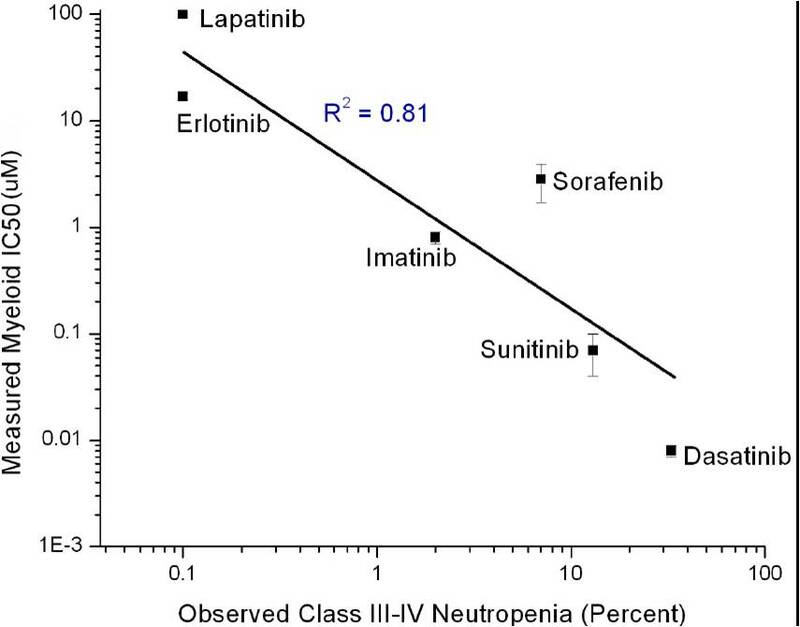 Myelotoxicity (neutropenia) is often a major dose-limiting side effect of Tyrosine Kinase Inhibitors (TKIs). Myelotoxicity/myelosuppression often occurs because the growth and/or differentiation of hematopoietic progenitors of the myeloid lineage in the bone marrow are affected by the administered TKI. ReachBio Research Labs’ HemoRANK™-TKI Assay Service Package is a standardized test system in which one or more test TKIs provided by the client are run in in vitro hematopoietic progenitor (CFC) assays in parallel with a panel of 6 therapeutic TKIs with known levels of clinical myelotoxicity. 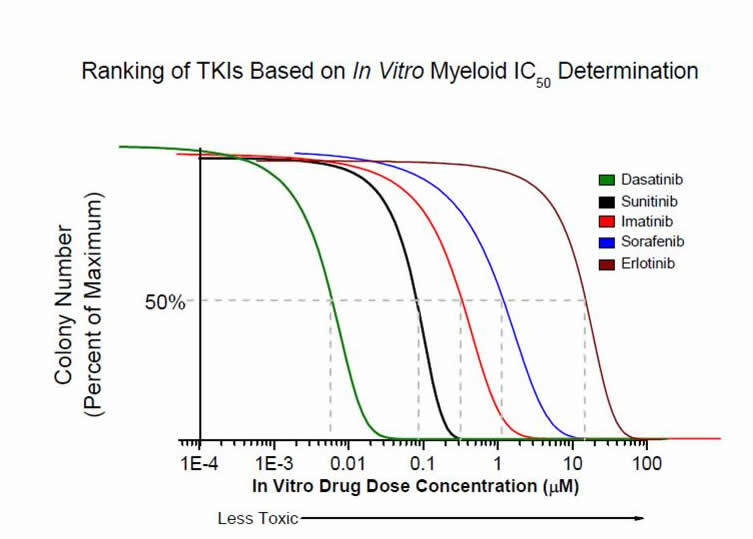 The IC50 values obtained for the test TKIs are ranked against the IC50 values of the panel of control TKIs, and the clinical myelotoxicic potential is predicted from the results. As shown in the figures below, expertly performed in vitro CFC assays can accurately predict the clinical myelotoxicity potential of TKIs. In ReachBio Research Labs’ hands, the rank order of IC50 values of a number of therapeutic TKIs tested in in vitro CFU-GM assays correlated directly with the degree to which the TKIs were reported to cause Class III-IV neutropenia in the clinic. This high degree of correlation between in vitro results and clinical observation strongly suggests that the in vitro CFU-GM assay system can be used to predict* the level of myelotoxicity a new TKI compound will likely show in the clinic, when compared with a panel of known TKIs tested in parallel. The differences in IC50 values seen in various species explains why in vivo animal models may not always predict for human toxicity. Customized in vitro assays for prediction of myelotoxicity of TKIs and other compounds are also available. Please CONTACT US to speak with one of our project scientists. *Predictions are ReachBio Research Labs’ scientific estimates based upon in vitro assay results and the correlations with clinical observations of the TKIs in the control panel as described above. ReachBio Research Labs does not guarantee that predictions based upon this system will always accurately reflect clinical myelotoxicity of new TKIs.